Readers may be surprised that Heartland Boy is suggesting that an actual bank saving account, as opposed to some plain-vanilla fixed deposit schemes, offers the best fixed deposit rates in town currently. Ever since DBS launched its DBS Multiplier Programme with headline grabbing interest rates, it has forced its key competitors to react accordingly. As a result, this has spawned a new type of hybrid savings account which typically rewards account holders with significantly higher interest rates than the moribund 0.05%. OCBC has its own OCBC 360 Account while UOB has its UOB One Account. After comparing the various bank offerings, Heartland Boy chose the OCBC 360 Account as he thinks it offers the best fixed deposit rates amongst the local banks. The bonus interest accumulates and pays when you do all of the above of any of the following. As an illustration, if you satisfy only criteria 1 and 2, you would still be eligible for 1.7% bonus interest per annum. There is no minimum balance requirement either. Make sure that the salary credited into your OCBC 360 Account uses a code recognised and approved by OCBC in order to earn the 1.2% bonus interest. A working adult should easily satisfy the criteria of paying 3 bills online (mobile phone, credit cards, insurance premiums etc). If you do not meet the criteria of paying 3 bills online, offer to help pay some of the household bills, such as broadband or utility charges, online. Whenever possible, apply for GIRO so that the bill payments are automated. This ensures that you will never forget and are guaranteed to complete that task. 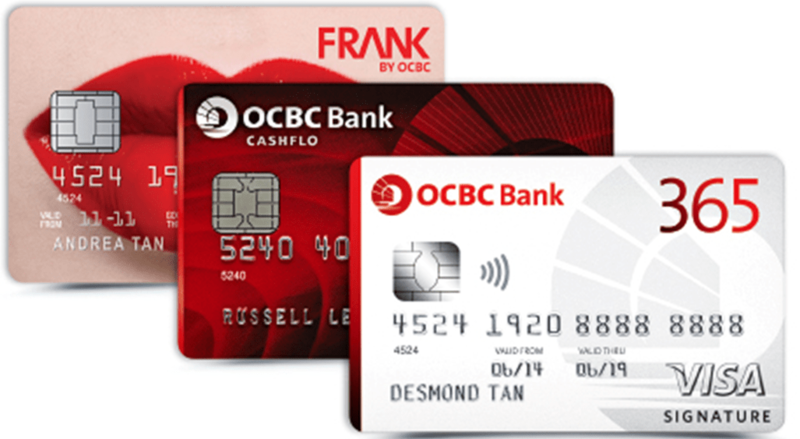 OCBC offers plenty of attractive credit cards, such as the OCBC 365, OCBC FRANK, OCBC Robinsons etc. Choose a credit card that is most compatible to your spending habits. For instance, if you enjoy dining out on weekends, you may apply for the OCBC 365 credit card to earn 6% cashback. If you are an online shopaholic, you can earn 6% rebate on OCBC Frank credit card. If you are paying bills to an organisation which OCBC Credit Card has a partnership with, you can apply to pay through GIRO for greater bang on your buck. For instance, Heartland Boy’s M1 bills are deducted monthly via GIRO on his OCBC 365 credit card. He gets a 3% cashback for setting up a recurring telco bill, as well as becoming closer to achieving the S$500 minimum spending on an OCBC credit card as required by the OCBC 360 Account. That is equivalent to killing 2 birds with 1 stone. Here is an another article detailing all the useful life hacks to reach the minimum spending required on your credit cards. If you are capable of making your own investments, you may consider forgoing the 1% bonus interest applicable for new insurance or investment products. That is because the expenses and fees that these products typically charge may well exceed the incremental 1% bonus interest that you earn. The bonus interest is calculated based on average daily balance, so you cannot “game” the system by withdrawing money at the beginning of the month and depositing money at the end of the month and still hope to get the full interest over the month. Previously, Heartland Boy was using the POSB Savings Account, an account his parents set up for him after he got tired of playing with his piggy bank. This account was paying a miserable 0.05% per annum and yet Heartland Boy continued using it out of habit and convenience. This was despite Heartland Boy knowing that he was actually losing money in real terms as Singapore’s historical average inflation was probably 2% per annum. However, since switching over to OCBC 360 Account, Heartland Boy feels awesome whenever he sees the bonus interest roll into his OCBC 360 Account. It was the same feeling he had when he was a small kid collecting candies after accumulating a series of stamps at the funfair. There is no lock-in period and you are free to utilize the savings inside the OCBC 360 Account whenever you need to. This is in contrast to the traditional fixed deposit schemes whereby there is a lock-in period. Informing Heartland Boy’s Human Resources Department to change his salary crediting account was surprisingly straightforward. All it took was an email instruction and he only had to do it once! If you are unconvinced and still fret over the hassle of changing your monetary habits, Heartland Boy can assure you that once you have done it, it will become habitual eventually and you will thank yourself for having done so! [Update] At the time this article was written, OCBC 360 indeed offers the best interest rates for a savings account. Times has since changes as has Heartland Boy’s life circumstances, and as such he has now switched to UOB One Account. Hey Alison, great to see you writing again, will definitely follow your posts! Not sure if your blog would like to include tips/”hacks” on how to meet the criteria of various deposit schemes for your readers such as 3 bill payment, or 3 giro for UOB ONE, min. spend for credit cards (like how to reduce it by $100 monthly) etc.. Note that publishing these would increase the chances of the system being tweaked though they are already much discussed in forums.. Yes, I would definitely like to include tips and hacks on how to meet the criteria of these various deposit schemes. I did try to give some tips based on my personal experience, although I do acknowledge that they are rather limited. Please share with me your tips as I am sure the readers will benefit tremendously. Please consider carefully before signing up this card. You may save a bit and the huge loss is in your way. Last year December 2015, I received late charge and interest charge of 200plus due to late payment for a week as I was away on business trip. I requested for waiver in Jan’16 they didn’t respond. In Feb’16 further interest incurred. I called them again and they only replied in Mar’16 No Waiver given. I wrote in email then letter no respond from them. In late Apr’16 I cancelled the card. They continue to accrue late charge and interest charge up to 500 plus now and it is still continuing. They have been calling me this month like a loan shark to clear this debt. I have also repeated to them that I want to speak to higher management but never. Today I received another call from them and I was shocked to hear from the officer that when I signed for this card I have agreed that there isn’t any waiver for any late charge or interest charge no matter what. When I signed up I was not highlighted on this. Anyway they claimed to take legal action against me and I have asked them to go ahead. Whatever it takes to pay I will fight all the way. I am going to get my reporter friend to help me to write an article in Straits Time for awareness on this waiver issues. IF YOU HAVE SIGNED UP OR SIGNING UP BECAREFUL WITH THIS NO WAIVER FOR LATE AND INTEREST CHARGE. DON’T END UP LIKE ME. Can I ask, if you set up telco bill as a recurring payment on 365 credit card for 3% rebate then that can’t count as one of the bill payments under the 360 account already is it? Or can it be counted both ways?